Attention to detail shows throughout this chair with plated and coated steel parts and hand finished cushions. The cushions are extra deep at around 3" and soft enough to give yet bulky enough to support due to the micro-cell foam normally associated with up-market beds. The adjustment is made through handles that can be turned to tighten and then levered over to lock. This enables the user to set the face and armrest panels at exactly the right height and angle before pushing the lever over to secure. For day to day storage and use, the chair is easy to assemble and stow or pop in the car. The seat pushes into the steel tube frame and the face support pushes onto the top section using the steel pins that are in place. 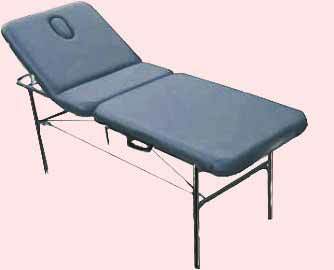 When not is use the chair folds neatly into a carry bag. face hole, chest pad and arm pad. It is light enough to carry yet very rigidly built with dual steel tubes and infinitely adjustable arm and facial panels. with steel and nylon fixings. High quality leather look PVC in black, blue or cream. 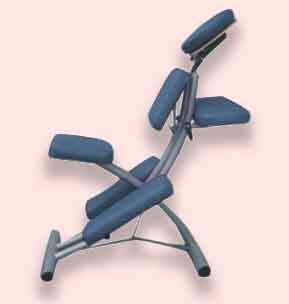 This economic portable massage couch with adjustable back rest is just the answer for home visits. 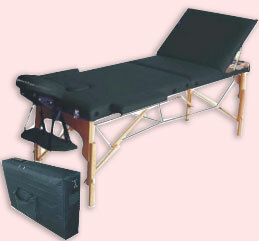 Lightweight at 19Kg and easy to erect the table can be transported from house to house or kept in a salon. It has black powder coated and electroplated steel framing with coated steel cross wires and a soft deep table cushion in a choice of black, white or blue PVC for easy cleaning and constant good looks. The table is designed for weights up to 160 kg and is adjustable for height. It comes with additional arm rests, head rest, arm cradle and face hole/plug. Assembly is very simple - unlatch the fasteners at one end and open the table like a book. The legs are adjustable and the cushions hidden inside the couch are just slipped into place. 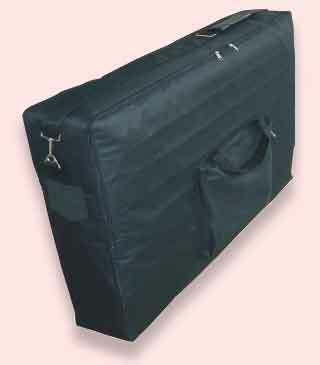 Price: £139 including carry case & mainland tracked delivery. 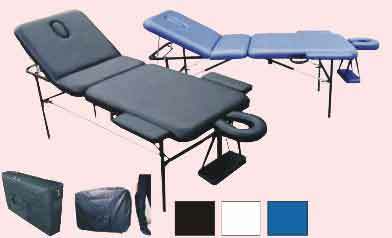 Size Closed: 925 x 660 x 140 mm / 3' x 2' x 5.5"
This top-end portable Massage Table is just the answer for home visits and home clinics. Portable at 17.5 Kg (a holiday luggage case normally weighs 23-32 kg) and easy to erect the table can be transported from house to house or kept in a health and beauty salon. For greater customer comfort the back can be raised or lowered to change the rake as seen in the photograph. The finish is lightly stained wood framing with coated steel cross wires and a soft deep 50mm table cushion in black or white PVC for easy cleaning and constant good looks. The table is designed for weights up to a maximum 250 kg and is adjustable for height. Assembly could not be easier - simply unlatch the fasteners at one end, open the table and stand on the floor. Size Open: 1950 (l) x 700 (w) x 730 mm (h) / 6'5" (l) x 2' (w) x 2'4" (h). 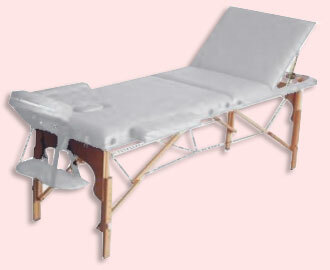 Cover your massage table with a heavy brushed cotton luxury sheet specifically designed for our massage tables. Please specify couch model when ordering. Low Price - Works out at £6.75 per cover!